Widening participation in HE is likely to continue to be a priority for many years to come. Likewise the desire by government for employers to pay a larger share of the costs of his seems here to stay. The logic runs a bit like this… If an online catalogue of modules rich in subject and discipline content can be established across HE providers, then individuals and businesses will be able to ‘pick and mix’ those that best suit their needs regardless of the institution offering them. Theoretically, this should allow individuals to create programme of study by collecting modules together that build towards an award. By contrast, the IDIBL Framework at the University of Bolton (the project I work on) has created a handful of modules that instead specify the processes of action inquiry for learning where students identify their own subject and discipline content informed by their practice. Both would claim to be attempts to personalise the learner experience and one way of explaining the difference is that of the concept of Variety which is an important aspect of the Cybernetic Viable System Model. Variety is explained by Ross Ashby (1964) as “Only variety can absorb variety”. Both approaches are attempting to match the variety of hundreds of thousands of learners with their own particular work-informed needs with modules and programmes of study offered by universities. The first approach does this by offering thousands of different modules at different locations, from different institutions with differing subject content attenuating (reducing/filtering) this potentially overwhelming choice through the use of technology so that there is a balance. Approach 2 matches the variety by trusting the learner to identify what it is they need to learn, based on real issues and opportunities encountered in the work-place. From this starting point they are supported in the development of an inquiry plan and learning contract that will enable them to meet the module requirements and their identified learning needs. In this second case, it is the student who contributes significantly to the attenuation of the complexity of their work-led learning needs with the modules on offer. On their own this would be a tall order, so an online community of inquiry with fellow learners and course tutors helps with this process. 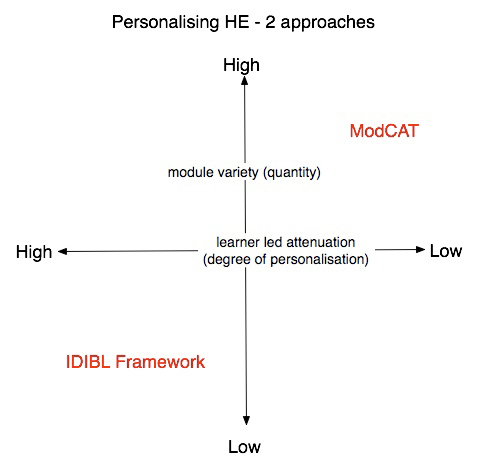 Arguably, approach 1 (ModCAT) is really about offering choice, whilst approach 2 (IDIBL Framework) has the real potential to offer a truly personalised experience. This entry was posted in Learning thoughts on May 15, 2008 by Stephen Powell. Interesting contrast. Horses for courses I suppose. If you can’t see what you want on the menu (ModCAT)we’ll fashion something to your own design (IDIBL). Actually, both approaches are in one sense ‘supply-led’ in that the HEI offers a framework of some kind and the learner ‘fits in’ with it. However some learners will clearly ‘demand’ a more personalised experience. Moving to a much more ‘demand-led’ approach for employers (who are becoming inceasingly important funders in all of this)requires us to take their ‘in-company’ training and accredit it. And quickly. And inexpensively. A plurality of approaches is what we need, I guess.